We all know where germs hide, your typical doorknob or restroom. But what about the other places that we don’t commonly think about? Here are 3 top places that germs hide in the office. We all remember to change out our sponges at home, but what about the office? 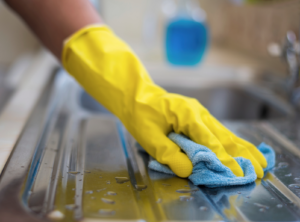 Experts say that there are around ten million bacteria per square inch on your regular kitchen sponge. Some people even say it has more bacteria than a toilet seat! Throw them out, or disinfect them with hot water above 60C. Germs lurk in the elevator! Many people touch those buttons all day long, creating more and more germs. If you have a janitorial company they should be disinfecting them daily. We touch them both all day, everyday. Sometimes they are touched by multiple people if you share an office or meeting room. Wipe them often with a disinfectant wipe and you are golden! Every office space is different and unique in it’s own way. There are many variables for each business that would create higher cleaning needs. There have been studies suggesting that having a clean and organized office encourages employees to be more productive. This alone is reason enough to have your space cleaned on a daily basis. For most businesses, they have client meetings and clients visiting them on a daily basis. In this case, you would want to make sure your space is clean, properly maintained, and professional. 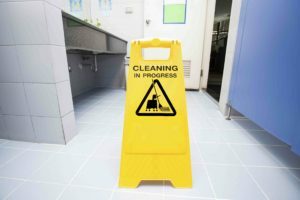 Some of the office tasks we suggest to our clients that are cleaned on a daily basis would include cleaning and maintaining employee bathrooms. To keep them fully stocked of paper supplies and to ensure all germs are rid of. Also, the common kitchen area. These two specific areas affect employee’s well being, mental state of mind and can help them be more productive. Clean office, clean mind! If you’d like us to give you an estimate on how often we believe you should need cleaning for your office in Edmonton and area, let us know! Looking for a janitorial service can be overwhelming. There are many companies out there that offer a variety of services and it can be difficult to compare them all. How do you really know that the value you’re getting is what you deserve? Here is a list of questions you should be asking during your meetings with each company. It is important to know the company background. How long they have been in business could potentially show the variety of situations that they have had to work through to get them to where they are today. The more experience someone has, the better they are at something. Does the company do full background checks on their employees? What do they look for when they hire someone? Do they hire anyone or what are their qualifications needed for the job? Most importantly, who will be let into your office each night? Knowing that the proper process is being taken when they hire their employees can put you at ease and you’ll have confidence that they will be capable to complete the job. What is their training process? Believe it or not, many companies throw their employees into new buildings and contracts (not all of course!!!) without ANY training or tours. Each building is different and will require different tasks to be done. Having a proper training regime in place will ensure that each employee knows exactly what to do each night and what is expected. Ask them how long they train each employee in each building and how. What tools and equipment do they use? We have come to understand that this should be something you NEED to ask from our employees who have come from other companies. I’ve heard all of the horror stories about the equipment, or lack of equipment they had to use. It’s quite simple really. If employees don’t have the proper cleaning tools and products to clean with, they are not going to be able to do a good job. How often do they service their vacuums? How often do they bring in new and fresh supplies for their employees? How do they ensure germs are not spread? This could also be answered in their training process. But you want to make sure systems are in place so that a cloth used in the kitchen or office is not used in the bathroom.